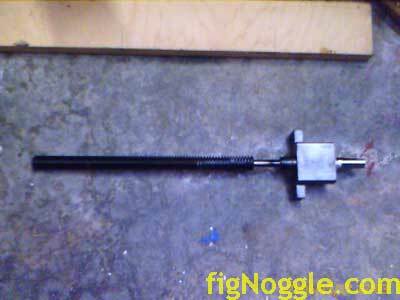 (260,’2006-12-18 21:45:27′,’david’,’2006-12-21 14:20:33′,’david’,’8″x12″/14″ Small Lathe Leadscrew and Nut Replacement with 5/8″x8 TPI ACME’,”,’Ever wanted to replace the stock leadscrew and nut from your mini-lathe or small lathe? We were wondering this ourselves. The stock leadscrew and nut is not of great quality and in fact quite “rough”. Since we have lots of Nook brand ACME leadscrews of 5/8″ diameter and 8 TPI (both right and left hand threads), we thought we’d give it a try. It helps if you have another lathe at your disposal. 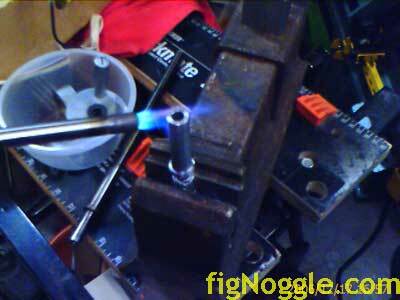 We used the 7x mini-lathe to turn the leadscrew and other pieces. 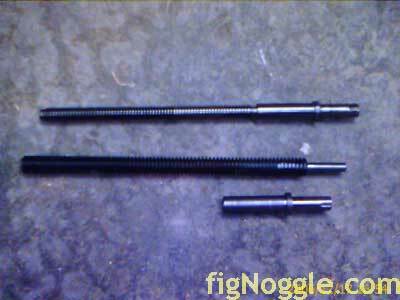 Since the 5/8″ diameter screw is of larger diameter than the stock, we ran into an intereference problem. 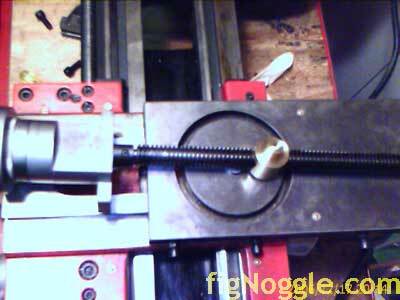 The stock leadscrew is turned from a single piece and slips through the bearing block spacer. Unfortunately, the 5/8″ diameter is too large for the spacer. Now, we could have just enlarged the through hole of the block, but that’s a piece not easily replaced. All that was needed was to turn down the bit for the recess and then the thread was tapped in the mini-mill. Since this nut wasn’t of the split variety, there is still backlash. However, it’s actually less than the stock setup! Unfortunately, the dials no longer make any sense since the stock reading is .002″ per click whereas now, it’s something a bit over .001″ per click. We’ll need to address this either by changing the leadscrew TPI so it’s an eas multiplier of the stock dial or change th dial itself (not so easy). 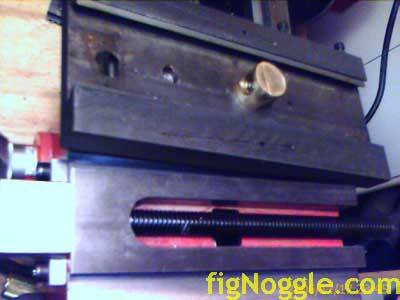 Ever wanted to replace the stock leadscrew and nut from your mini-lathe or small lathe? Since we have lots of Nook brand ACME leadscrews of 5/8” diameter and 8 TPI (both right and left hand threads), we thought we’d give it a try. Since the 5/8” diameter screw is of larger diameter than the stock, we ran into an intereference problem. 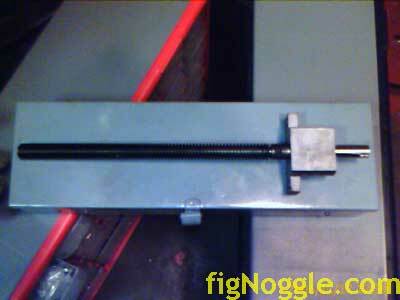 The stock leadscrew is turned from a single piece and slips through the bearing block spacer. Unfortunately, the 5/8” diameter is too large for the spacer. Now, we could have just enlarged the through hole of the block, but that’s a piece not easily replaced. Since this nut wasn’t of the split variety, there is still backlash. However, it’s actually less than the stock setup! Unfortunately, the dials no longer make any sense since the stock reading is .002” per click whereas now, it’s something a bit over .001” per click. 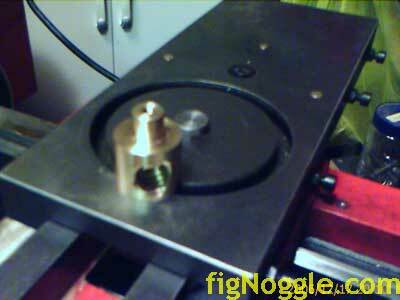 ‘,’Ever wanted to replace the stock leadscrew and nut from your mini-lathe or small lathe?